Save time and money on booking separately hotels, transfer and day tours and have everything in a package with a carefully designed itinerary. There are astonishing experiences ahead of you in a tour especially made to exceed your expectations. Rila Monastery and Boyana Church (UNESCO) and all the major sites of interest in cities of Plovdiv (the European Cultural Capital for 2019), Sofia and Veliko Tarnovo are included. Entrance fees, transfers from/to Sofia airport and private transportation with convenient car or minivan throughout the tour, English-speaking guide, Accommodation for 4 nights in a centrally located 3-star hotel in Sofia on BB, VAT and all local taxes. You will be met by a representative of our company and transferred to a 3-star hotel in the center of Sofia for 4 nights. The hotel is hand-picked. It will be a hotel like Sofia Place or simar. 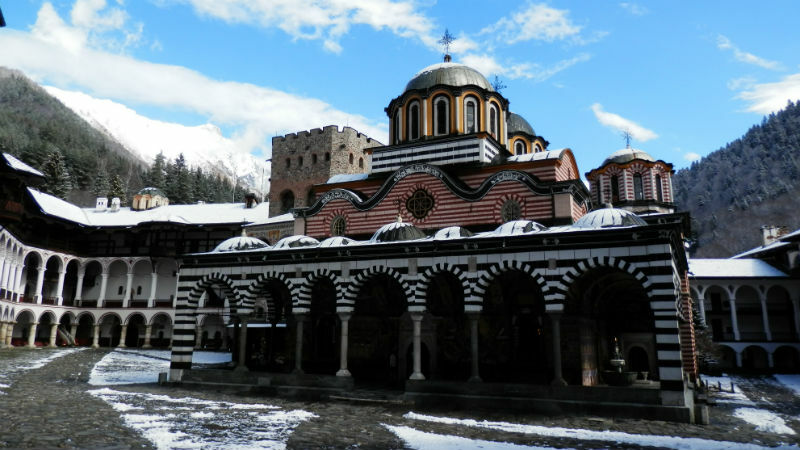 Today you will join our best-selling day tour to the iconic Rila Monastery and Boyana Church. You will see, learn and experience two of Bulgaria's top UNESCO attractions and also enjoy fabulous views of Rila National Park and have an option to try local organic food specialities. It is a shared tour, but you will receive as a bonus of door-to-door service. Pick-up and drop off from your hotel is included in the package. Boyana Church possesses unique frescoes dated back to 1259 that are a great contribution to the European Cultural Heritage. They have features of a Renaissance artwork, but actually, predate the Renaissance period that was started in Italy. In the afternoon you will have the opportunity to join the Free Sofia Tour - the highest ranked on TripAdvisor tour of Sofia. It follows the same route as the paid tours do. Today you will join our long, but a very rewarding shared tour to Plovdiv and Koprivshitsa. You will be visiting the second biggest and full of historical monuments and artwork town of Plovdiv. It is the European Cultural Capital for 2019! Koprivshtitsa is a small town with preserved architecture and vibe from the 19th century. You will be exploring it also on foot with a guide beside you. Pick-up and drop off from your hotel is again included. Plovdiv – the artistic capital of Bulgaria. A guided tour of the Old Town – an architectural complex of medieval churches, neat houses from the late Bulgarian renaissance and numerous well-preserved Roman buildings (2-5 century). We visit the ethnographical museum located in a revival period house with 130 windows! Internationally famous painters and artists find their inspiration and muse in the Old Town of Plovdiv. A cup of aromatic coffee from some of the shops with breathtaking views over the town and then we continue along the cobbled streets towards the Main Street and the modern center. There will be free time for lunch and shopping. Koprivshtitsa is a somewhat different town from all other Bulgarian settlements. It has been the center of the Bulgarian uprising against the Ottoman Empire and miraculously it has not been burned down and all its architectural masterpieces from the 19the century - a time of the Bulgarian Renaissance, are well preserved for nowadays visitors to admire. Accommodation: 3-star hotels, en-suite double rooms on bed and breakfast. Price: 1 pers. - 540 Euro; 2-3 pers. - 310 Euro/pers. ; 4-7 pers. - 270 Euro/pers. ; 8-12 pers. - 250 Euro/pers.